This was my first attempt at using a cedar plank….the salmon was amazing…but the plank didn’t survive too well…I soaked it for 2+ hours…I guess I will try longer next time, because there WILL be a next time!!! your salmon looks tasty! 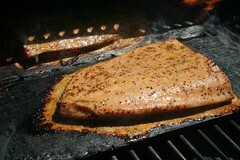 Next time you soak the plank you may add some wine and some lemon juice to enhance the flavor. It’s a new experience to enjoy.